Spoilers for The Time of the Doctor. 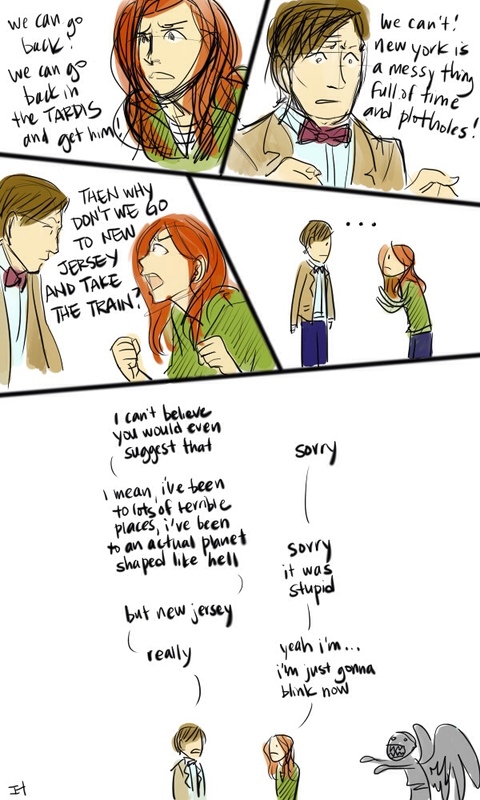 I was half-expecting something like this to happen with the Ponds' departure. The Doctor, realizing that New Jersey was just too lame, would himself follow Amy and Rory into the angel's arms, live out their life with them, and show up in the graveyard a few moments later. I'm rather glad the events in "The Name of the Doctor" weren't really the prophesied events; that would've been pretty lame. That they allowed the audience to think so could've cost them some serious viewership points. They actually now ended up with a decent account for how the Doctor would've allowed himself to get caught up in all this, or "a minor skirmish" finally finish the "old man" off, not so bad. I guess the Daleks' "Doctor Who?" period didn't last so long. So, what actually happened to Gallifrey after the Daleks were presumably defeated? Presumably they still would've wanted to come through. Sorta looking forward to the revival, even if the Curator's suggested search didn't last so long. The big inconsistency/retcon is, of course, the new regeneration schedule. All previous references to eleven's regeneration were effectively retconned to be false or misleading (Lake Silencio, after the poisoning in Berlin, "no regeneration" in The Girl Who Waited, "I can regenerate now...burn out any little Cyber widgets in my brain"), and eleven would've known this entire time that he had no fallback, which doesn't really seem to fit well with his gung ho characteristics. I mean, unless he truly forgot about Hurt. Where's the Valeyard! If we're to keep faithfully to the new regeneration cycle, between the twelfth and final regeneration would be Tennant's stint between "Journey's End" and "The End of Time", making the most likely candidate the Meta-Crisis Doctor. I thought Time of The Doctor was poor. It was hardly an epic solution to the regeneration conundrum; The Master had his cycle renewed in The Five Doctors, so it was possibly the most obvious solution going. Moffat needs to give up while he's behind. It was... ok. But that's all it was. Here's hoping for some better stuff next year. Yeah, the entire conundrum was introduced then solved by Gallifrey ex machina over the course of a few minutes. They didn't have to make eleven the last regeneration; they could've left it for an incarnation that was more believably desperate. It would probably have been better to have had a story arc on it, during which things would've gotten dire enough for us to believe the Valeyard could come about. I blame the recent disposition toward one-parters. I think legit forgetting about the War Doc is okay. I mean, he hadn't remembered any of what was happeneing with the exception of what Tennant remembered with the portal between worlds, which was kinda before stuff started really happening. And what do you mean by eleven? Because it was 12 regenerations, 13 doctors. As for granting extra regenerations - the time lords did the exact same thing for The Master loads of times, reviving him from his half life (see whatever the Tom Baker episode with the courtyard in the TARDIS was for how he ended up like that), bargaining extra regens at other times and so on. I had absolutely no issue with that and it was actually pretty consistent, purely because everythign about how they work and how they are shown has always been so inconsistent. I'd say anyone seriously complaining about inconsistency only started watching in 2005. Correct me if I'm wrong. The tears opening up and closing up like that was tacky though, and I agree re: why did they just go away? But then again, why not? They're time lords and can choose whenever they wanted to come back. For example when there was less chance of starting another war (not just Daleks in that war remember). They got what they wanted - they now know which universe to aim for. I found the very end a bit anticlimactic by modern Doctor Who standards, which is sorta fine as the whole overblown regeneration thing is only something which came with the reboot, and have never been a massive fan of Moffat(t? too lazy to check)'s fairytale-style plots, but the episode was enjoyable enough. KeenEmpire wrote: They didn't have to make eleven the last regeneration; they could've left it for an incarnation that was more believably desperate. Exactly; I think Moffat just wanted to be remembered as the man who solved the regeneration limit. On a positive note, that would mean that he isn't planning on stickking around until Capaldi's regeneration. Keening_Product wrote: I'd say anyone seriously complaining about inconsistency only started watching in 2005. Correct me if I'm wrong. However, that doesn't make me a novice when it comes to the '63-'89 years. I have seen an embarrassing amount of classic Who since being introduced to the show as a kid. When I was 11, I had already watched all of Hartnell's surviving episodes. You're right, of course, that Doctor Who is fraught with inconsistency - and it wouldn't be quite the same without it. I just felt that Smith's last episode was lazy. The actual regeneration itself was a bit abrupt, I thought. I disliked Tennant's, because he spent too long moping about it and he wasn't a mopy character. I really wish that the next one will be more like the first nine, perhaps bar Tom Baker where The Doctor sacrifices himself saving the day, perhaps says a quick goodbye, and then he's gone. Perfect. I don't like that Tennant's and Smith's final episodes were about them dying. We still call him the eleventh doctor. Don't know why. He calls himself the eleventh doctor. Still don't know why. Keening_Product wrote: As for granting extra regenerations - the time lords did the exact same thing for The Master loads of times, reviving him from his half life (see whatever the Tom Baker episode with the courtyard in the TARDIS was for how he ended up like that), bargaining extra regens at other times and so on. I had absolutely no issue with that and it was actually pretty consistent, purely because everythign about how they work and how they are shown has always been so inconsistent. I'd say anyone seriously complaining about inconsistency only started watching in 2005. Correct me if I'm wrong. I wasn't referring to the inconsistencies within the Time Lords' regeneration-granting abilities (though, frankly, there probably are many) but those within eleven's tenure. I'm pretty sure eleven was acting as if he could regenerate this whole time. Trying to repress an incarnation is one thing; forgetting about him so completely you forget to include him in your regen calcs is another thing entirely. Another beef I just remembered with this episode (I raised a similar issue during the Name of the Doctor) was that it didn't really adequetely explain eleven's fear (to the point he was accepting of death) upon finding out the question. It wasn't exactly a code to unlock the Time War or anything. What, did the Doctor know if he answered it, the Time Lords were going to come back? Wooden cyberman was pretty lulsy. Using flamethrower, this can't backfire at all.